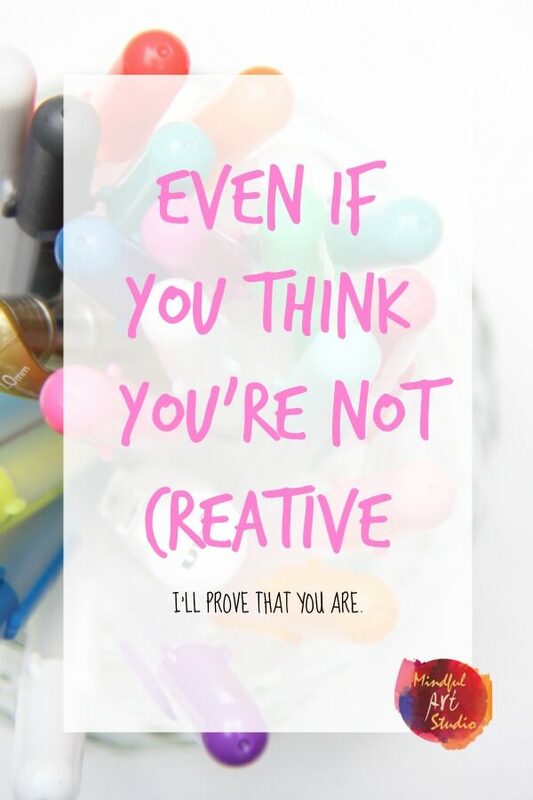 One of the things that scares artists of all levels of experience is creative block. 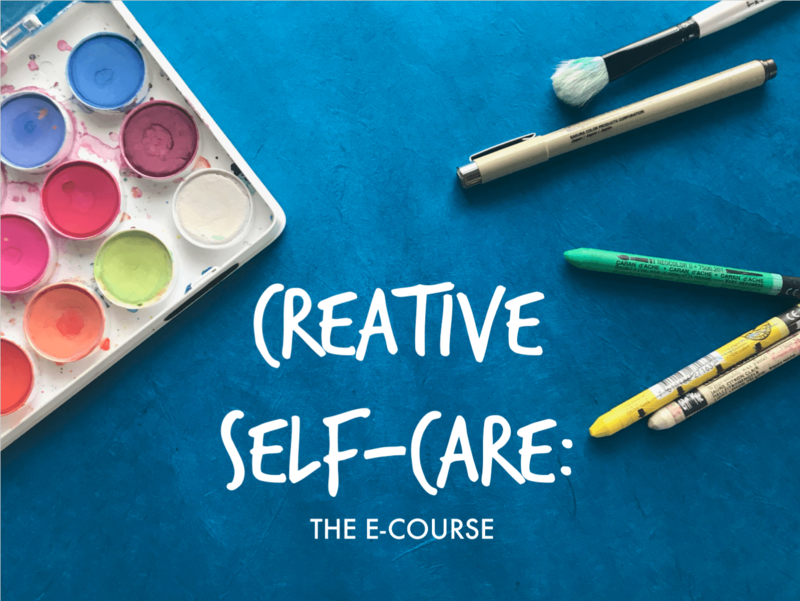 It’s something we talk about all the time in our Facebook group, Creative Self-Care, but something that even professional artists confront. 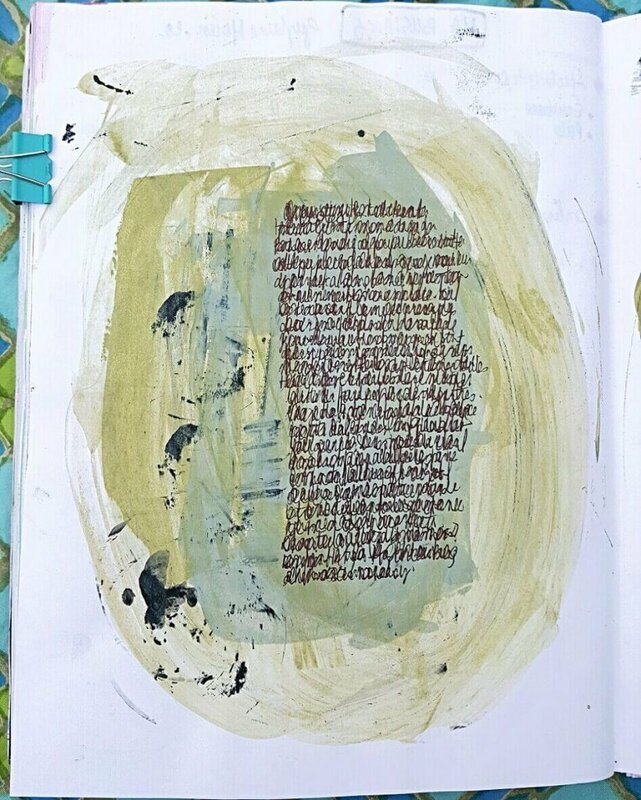 You can see this encouraging Instagram post from my internet art buddy Roxanne Coble, who candidly shared just how deep and discouraging creative ruts can be. 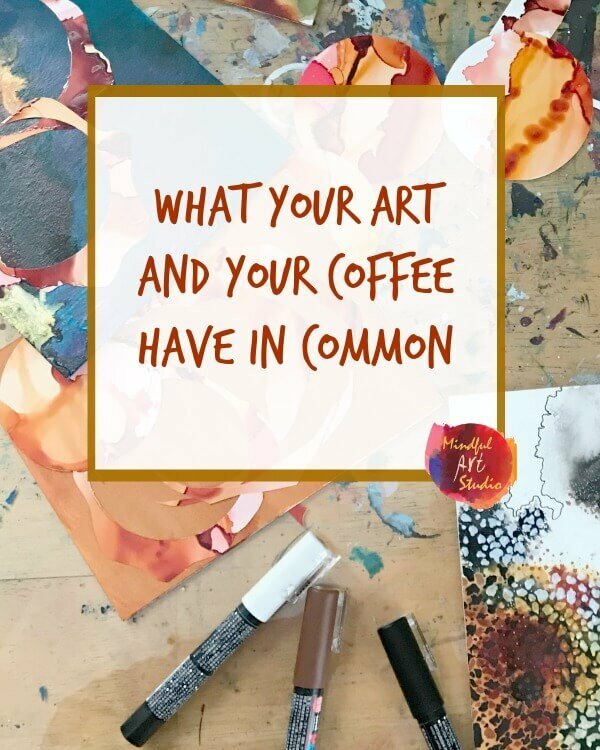 Today I’m sharing a bit about my own creative routines over the last few years, and why they’ve helped me weave more art into my everyday life. 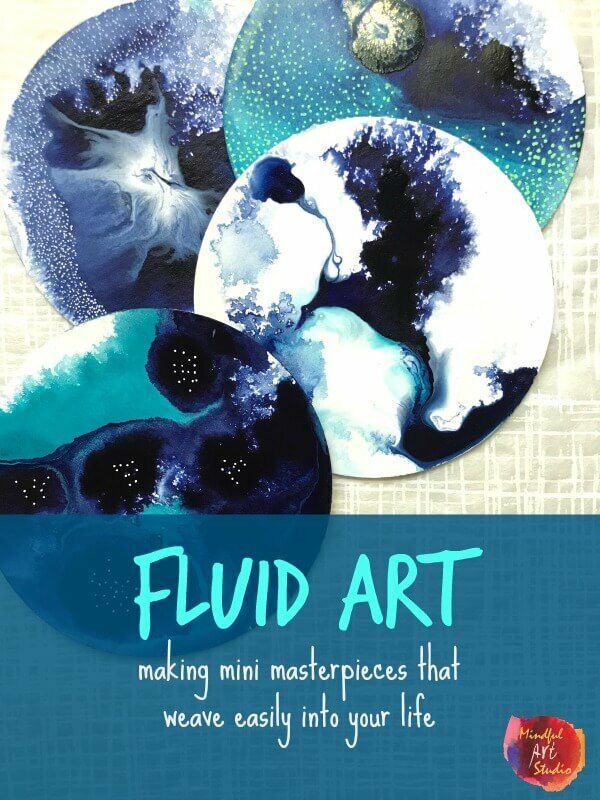 If this gets your beautiful, creative heart pounding, you can learn more about my new class, Fluid Art, and for a limited time, take advantage of the pre – sale price of $99 with code: FLUIDART30. 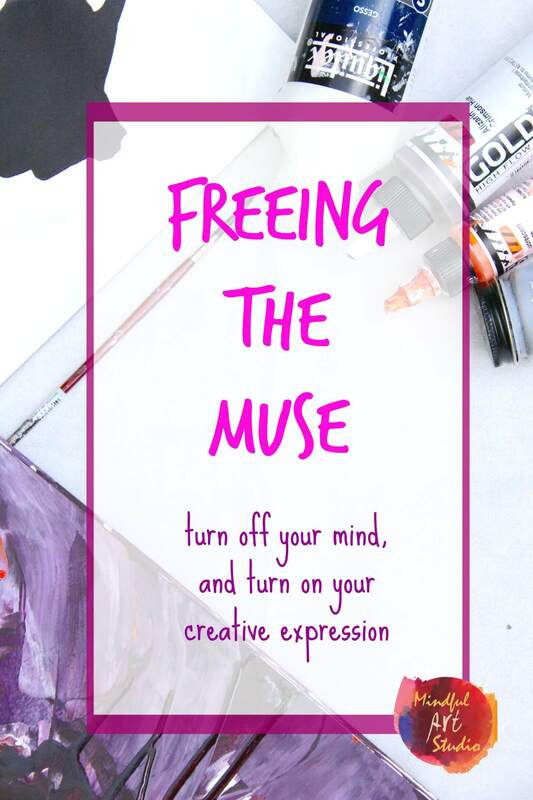 What helps you overcome creative block? Tell us about it in the comments. *Some of the links in this post are affiliate links. 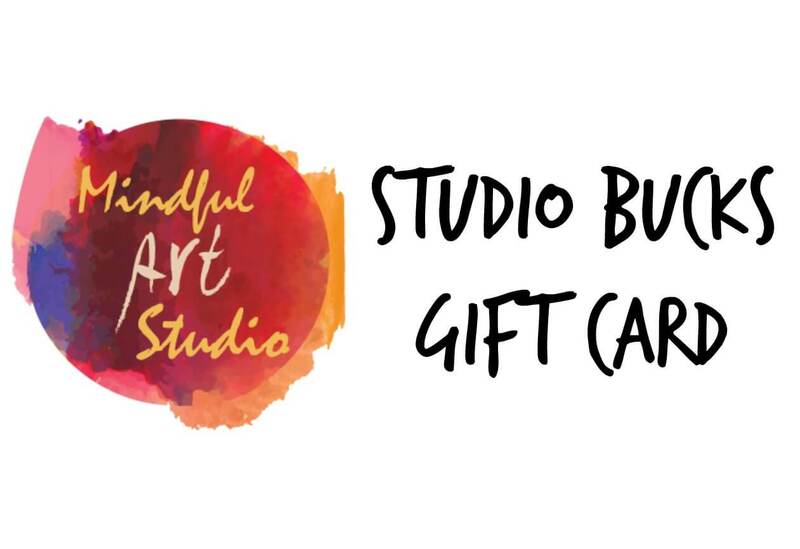 That means that if you choose to click and purchase something, at no extra cost to you, you’ll be supporting the work of Mindful Art Studio to empower the artist in all of us. 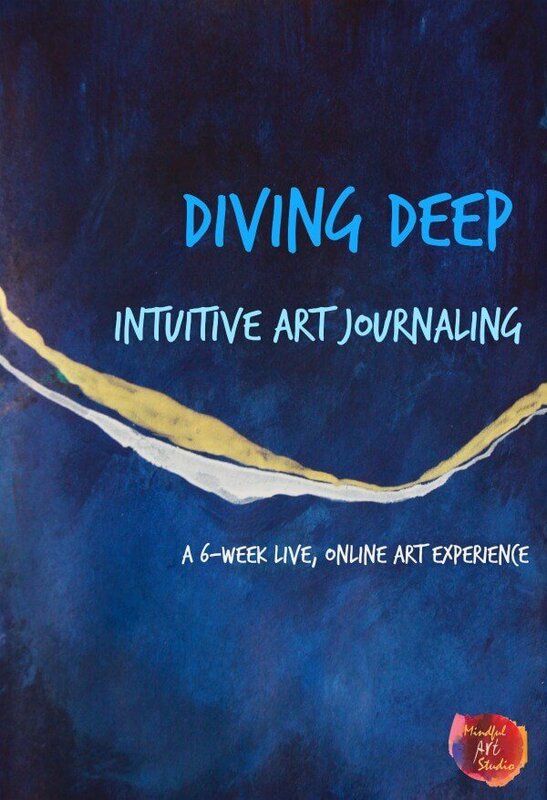 Each day this week I’ll be bringing you an interview with an artist from the Mindful Art Studio community. These women are just like you. 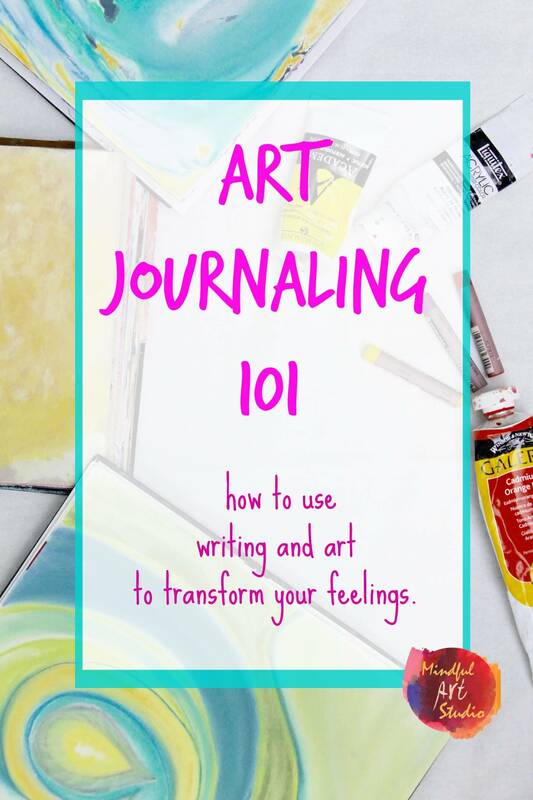 They will share how, despite the voices of self-doubt, they use paint, words, photography, music, and art journaling to express and explore their feelings. 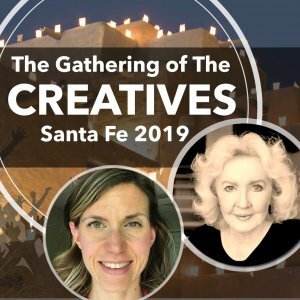 I’m thrilled to share these interviews with you because I know that as you read these inspiring stories, you’ll see yourself, and hear the muse asking you to let her in to play. 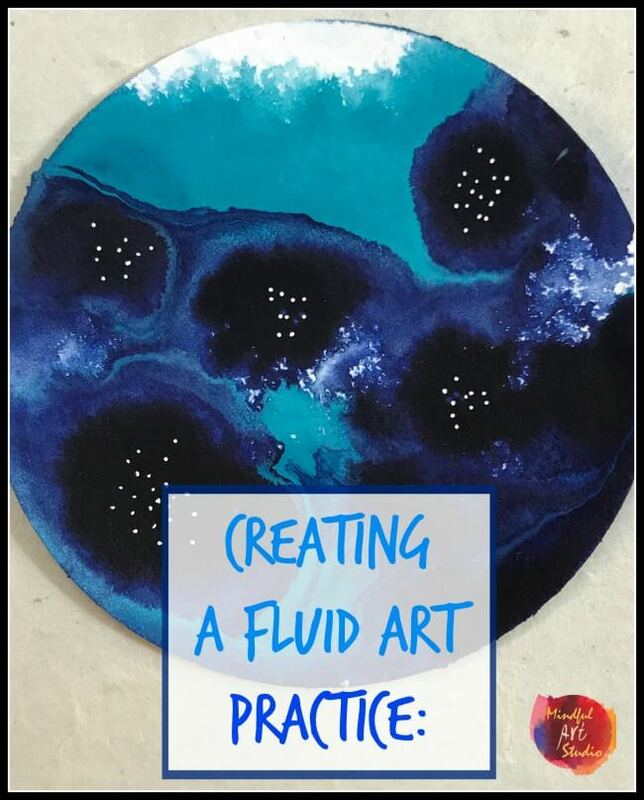 I know that once you do that, art becomes a powerful way to know and care for yourself, and you’ll find the moments of wonder and joy that are missing in so many of our lives. 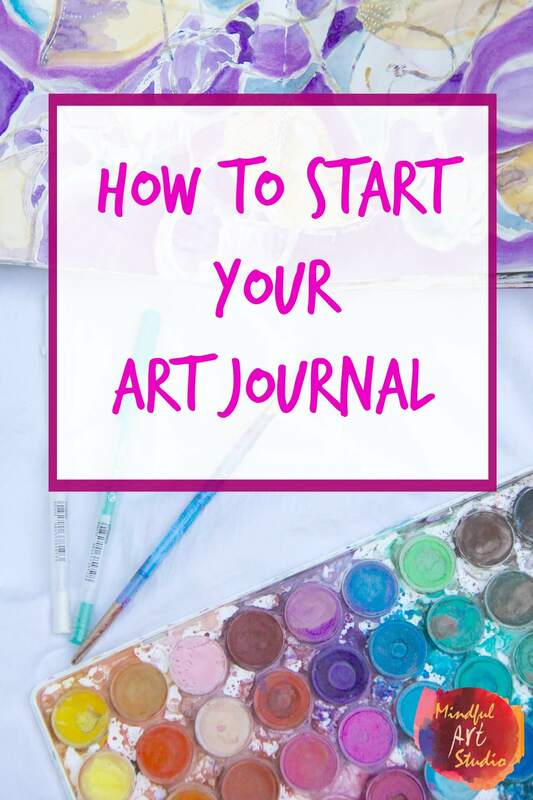 I know that getting started can be overwhelming sometimes. 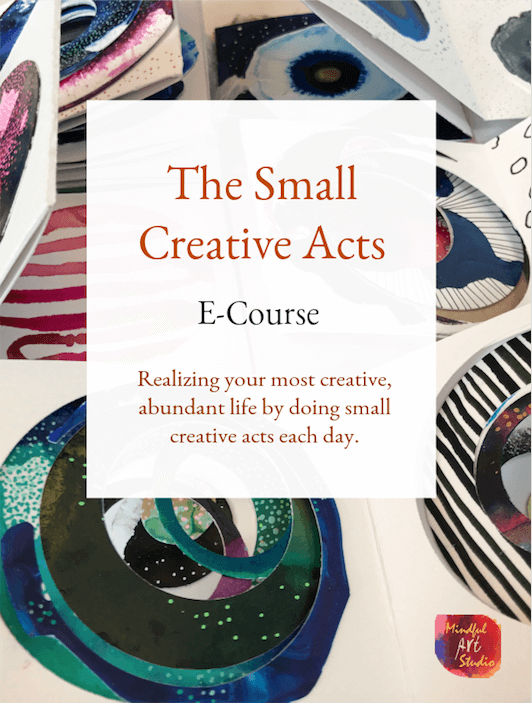 Each day, I’ll offer some resources to help you take the next step towards living the creative life you desire. 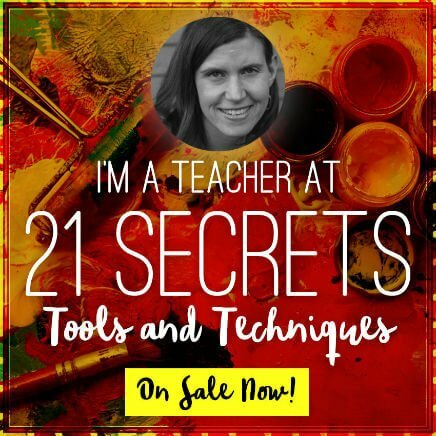 If you are ready for some structure, guidance, and inspiration to get started right now, go straight to my classes page, learn more about my creative mentoring services, or grab my e-book to get started right away. 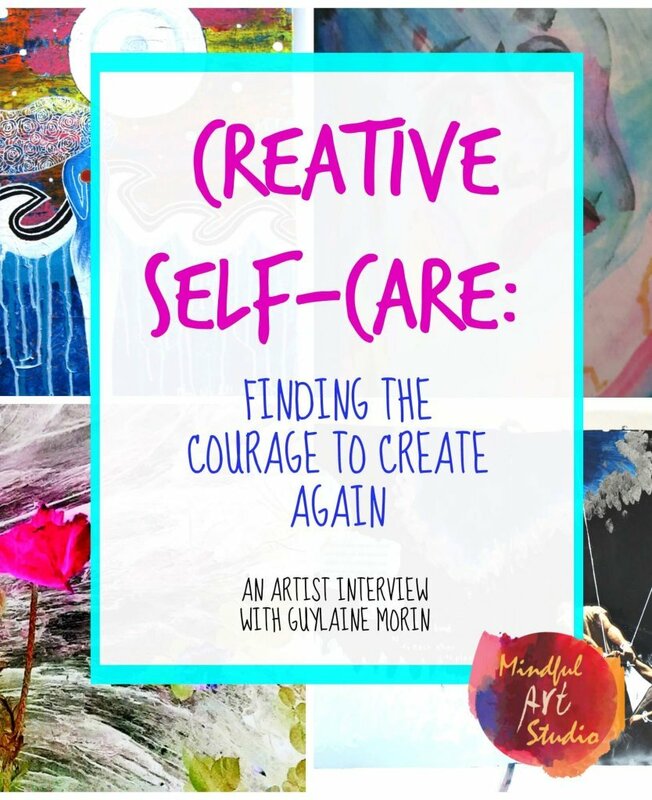 Otherwise, get cozy in your chair, and enjoy a few minutes of this inspiring conversation with Guylaine Morin, of Montreal. Regardless of how you get going, if these women’s stories speak to you, don’t let the moment pass by. 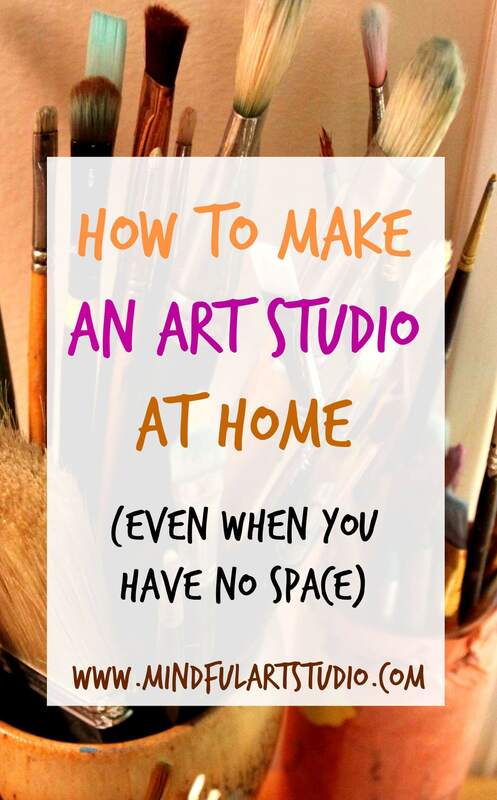 Pick up the nearest pen and paper, paint, or bunch of clay and create something. Just start. You deserve it. 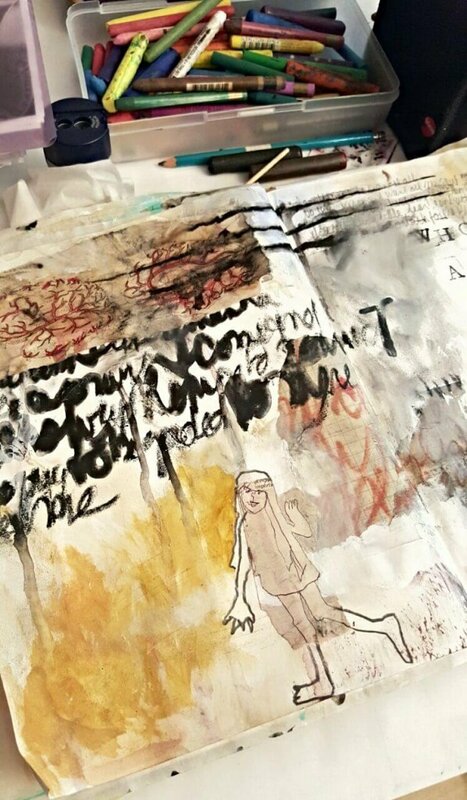 Click here for the Neocolor crayons that Guylaine uses to make these painty, smudgy drawings. I have a very clear memory of drawing with two friends. We’re 4 years old, lying on the kitchen floor with pens and papers. We’re doing drawing contests, and I win every round. At this young age, I remember drawing with a lot of confidence and facility, being inspired by whaterver was around me. One of the most precious memories from my childhood is me singing and dancing with the tree and the wind on the balcony of and old church. I remember being totally absorbed by what I was doing, responding to the wind and singing my favorite song. There was absolutely no negative thought or self-doubt. I was just connected to joy and freedom. More than 40 years later, I still feel deeply moved by the magic of that moment. My mother was always very pround of my drawings, always wanted to frame them and put them on the wall. Despite this, there was no art in our house. No art books or museum trips. Drawing was seen as a childish activity. So when I had to choose at school between art class and physics class, I had to drop art. I do recall though, when I was around 8 or 9, we had a neighbor who invited me to do art at her house a few times. Her house was full of books and many strange objects and it was also very dark. She showed me how to use watercolors and I created a beautiful landscape of the sea. I still have it and keep it preciously in my memory box. As a child, going in her home and doing art with her was like a breath of fresh air and I knew, even at this young age, that what she was showing me was important and precious. I felt the urge to create, to express what I was feeling, to contribute, but I just couldn’t do it. 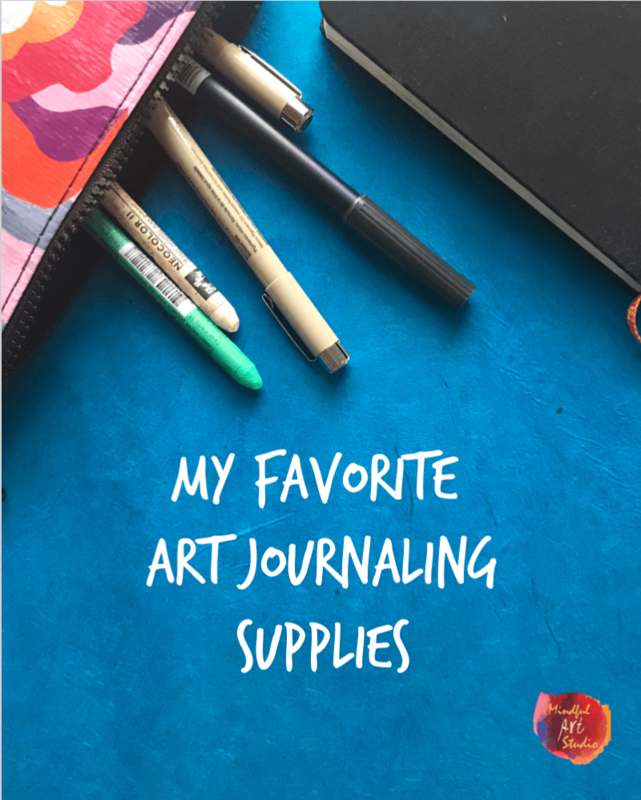 Sitting at my table with all my art supplies, looking at everything, I felt paralyzed. It was really, really painful. 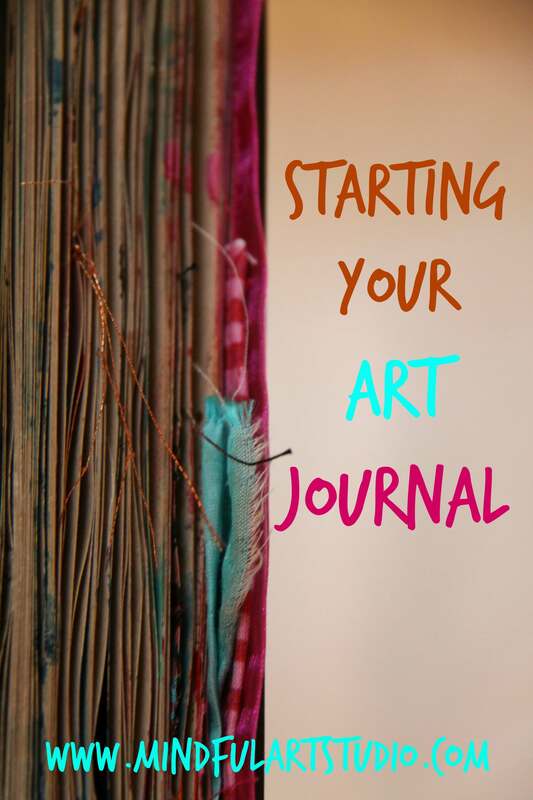 And one day, about 4 years ago, I discovered some art journaling videos. 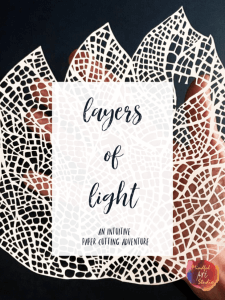 I watched for days and days- totally fascinated by the process and the results. I thought maybe I could give it a try. After a few weeks, I decided to put my art table and supplies back out. Slowly, I gained confidence and reconnected with the joy of creating. 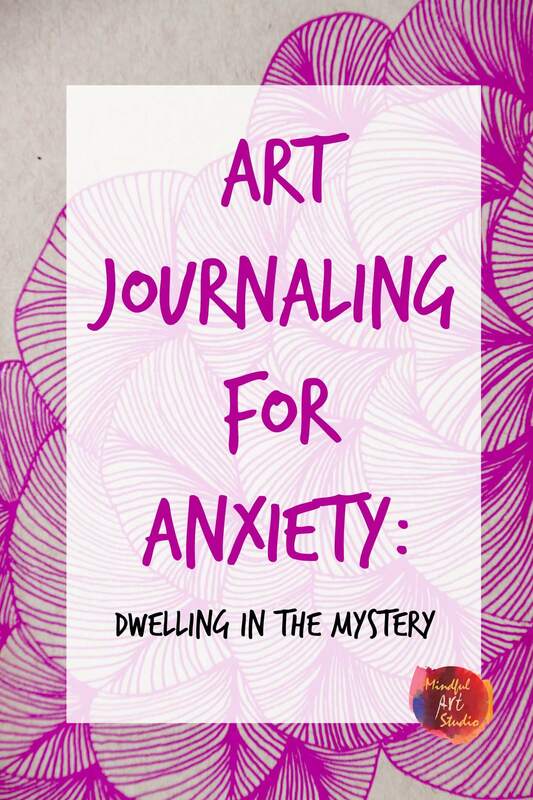 Art journaling saved my life and helped me reconnect with parts of myself that I had let down for so many years. 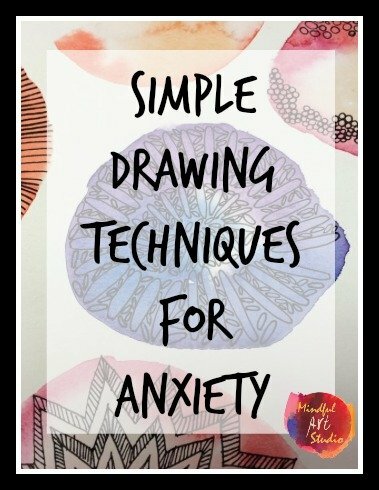 If you feel paralyzed like Guylaine did, and are having a hard time coming back to or beginning an art practice. 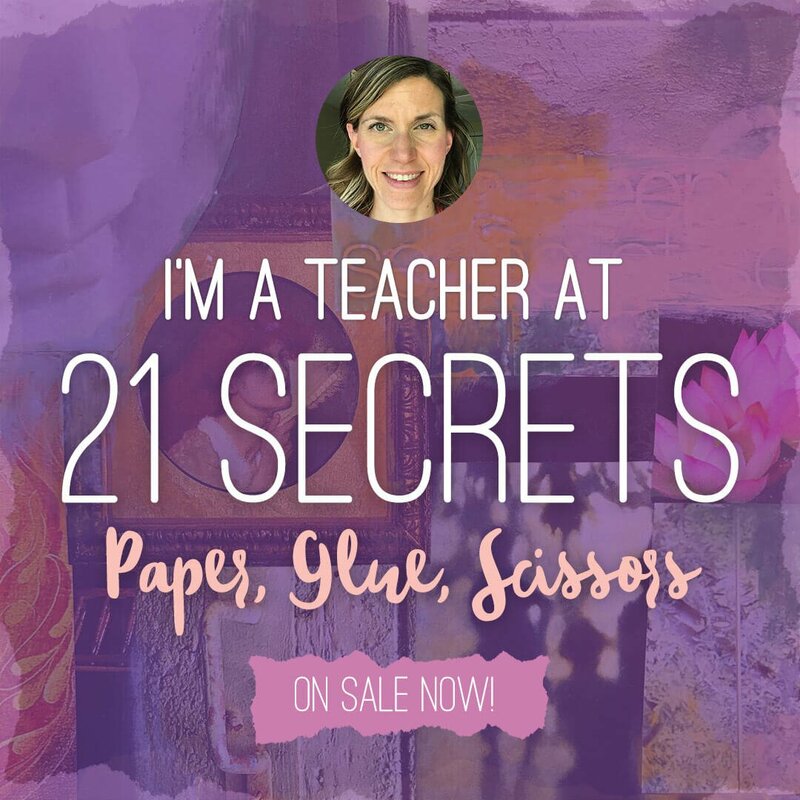 I can help you identify the blocks that are getting in the way, some gentle ways to open up, and find your joyful, heart-centered creative life. 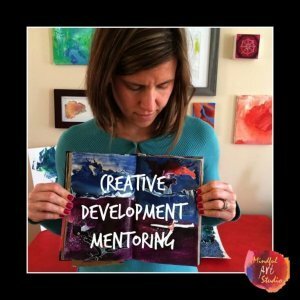 I work with women just like Guylaine and you to unlock your creative potential in creative mentoring. Click here right now to learn more. 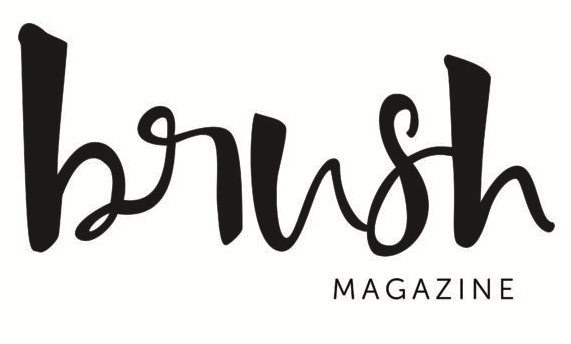 AMY: Do you have artist friends? 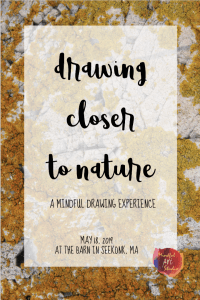 Why is being in the Mindful Art Studio community so important for you? there anything else you’d like to add or that you feel is important to this conversation? 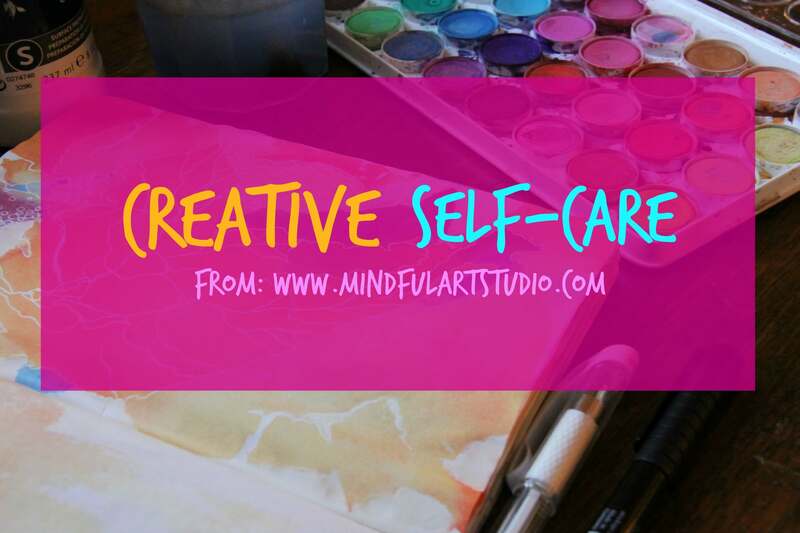 Being in the Creative Self-Care group helps me build confidence to show my art. After all those years where I destroyed almost every creations as soon as they saw the light, I now feel the need to show someone. 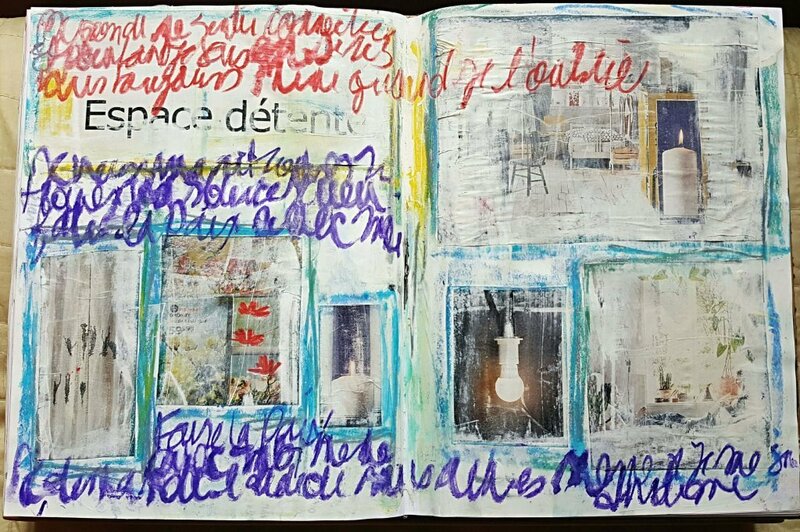 It is a safe place, where I can share my journal pages that are not particulary “beautiful” or “perfect” as well as those one who are more artistic. I feel a lot of respect by the members and I also feel the caring. 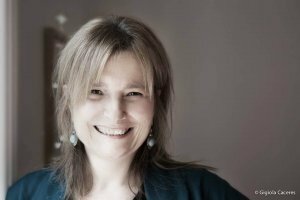 Guylaine Morin is a mixed-media artist and a storyteller living in Montréal. 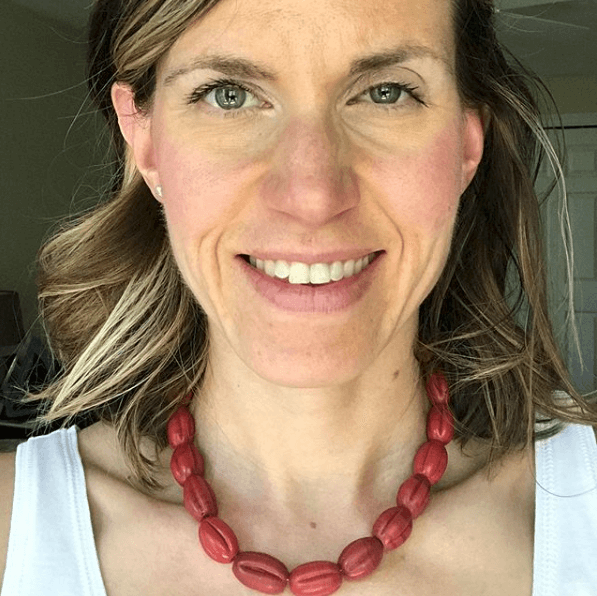 She leads workshops for women who want to connect to their true Selves and explore creativity in a community where authenticity and respect are the foundations. 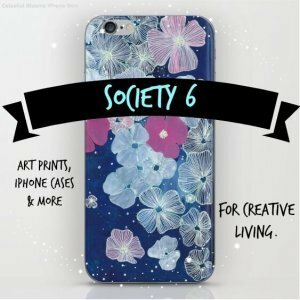 *The product link in this post is an affiliate link. 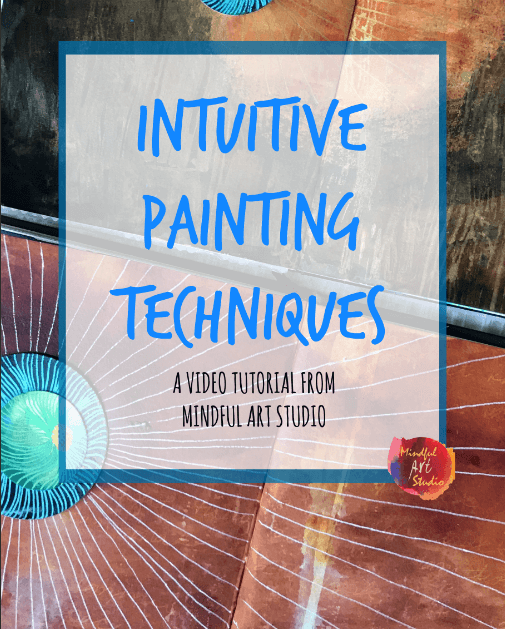 That means that at no extra cost to you, if you choose to click and purchase something, you will support the work of Mindful Art Studio to empower the artist in all of us. Thank you!